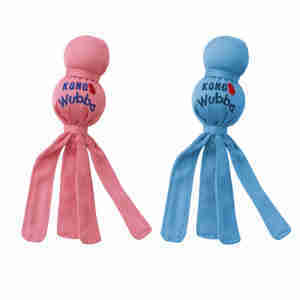 Kong Puppy Wubba is perfect for tugging, throwing, cuddling, and chewing, the Kong Puppy Wubba is about to become your puppy's best friend. Made from super-tough reinforced fabric and stitching, the Puppy Wubba includes two squeakers in the top section for when puppy just wants to make some noise and is sure to keep you and your puppy entertained for hours at a time. Always ensure play is supervised. This toy is not recommended as a chew toy and is not indestructible. A very durable and safe toy for my puppy to play with, he likes it tossed to chase after, playing tag and also just sitting and chewing on the strands. this was the first toy my westie puppy Angus went for on his first day in our home! loves it, durable, extra fun with the squeek! Angus loves playing with i with us and himself! brilliant way to pass the time.